VELOSAN is a Quaternary ammonium compound used in food processing and industrial areas to disinfect and clean hard surfaces. It is an effective one step sanitizer for non food contact surfaces and food contact surfaces where a rinse is not required. 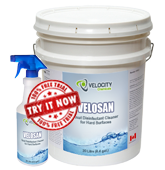 VELOSAN is also recommended for use in hatcheries, poultry and swine premises to disinfect and clean equipment or heavy duty vehicles, and other hard surfaces.